Place the cherries in a bowl and cover with rum. Allow to soak for several hours or overnight. Heat the light cream and sugar together until the sugar is dissolved and bubbles begin to formaround edge of the pot. Whisk yolks until creamy. Add 1/2 cup of the warm cream to the egg yolks. Pour the warmed yolks back into the half-and-half and continue to cook, stirring, until the custard mixture coats the back of a spoon. Do not boil the mixture or it will curdle. Stir in the vanilla, allow to cool completely, then chill. Pour into the ice-cream maker and freeze according to manufacturer’s directions. Drain the cherries. 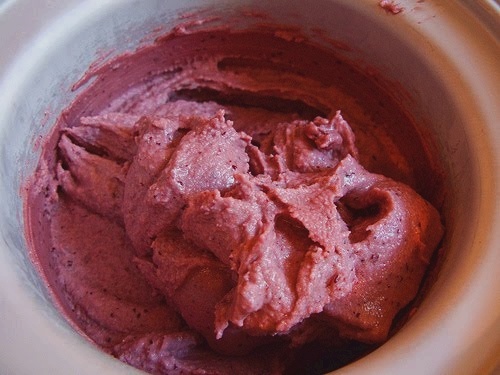 When the mixture begins to thicken as it freezes, add the cherries and freeze until ice cream is the proper consistency. Hi I found you on link referral. i love your blog because I am fond of discovering new Asian recipes. feel free to stop by my blog if you fancy recycled and handmade stuff. Glad to be your newest follower too.